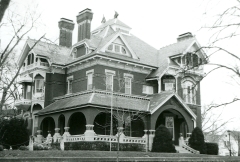 The three-story, red brick Victorian-era Queen Anne-style house was constructed in 1884-1886 for lawyer and politician B. P. Waggener. Waggener, who served as mayor of Atchison in 1889 and 1895, served in the State House of Representatives in 1903 as well as the State Senate in 1905 and 1907. The house is nominated for its association with Waggener and being a fine example of Victorian-era Queen Anne-style architecture. The Balie P. Waggener house is as an excellent example of the Second Empire style of architecture applied to a two-story frame dwelling. 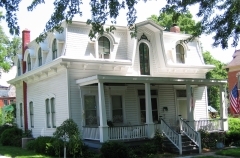 Originally constructed in 1879, the Waggener house is nominated for its architectural significance as well as its historical association with Balie P. Waggener, an early leading citizen of Atchison, businessman and a prominent lawyer. Waggener was also involved in local and state politics. The Kansas City-based architectural firm Sayler and Seddon designed the 56,000 square-foot Wherrett-Mize Drug Company Building in 1911 when the use of warehouses in Atchison expanded and helped transform the city into a competitive distribution center. Built as a drug wholesale warehouse, the three-story building is constructed of reinforced concrete with red brick walls and features subtle Classical detailing. These characteristics reflect common attributes of early 20th century industrial warehouses. 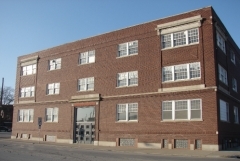 The company's offices and showroom were located on the first floor, and they used the warehouse space to store their goods, which included pharmaceutical drugs, patent medicines, toiletries, sundries, gifts, and toys. The building served as a warehouse until July 2009. It was nominated for its local commercial history and its architecture.